A new name to me, but turns out that Lisa Cee has been a fixture on the Southern California roots and blues scene for quite some time, including a stint as the leader of the house band in the Gibson and Fender Guitar Lodge during the Sundance Film Festival. This is her Rip Cat debut, and sees Ms Cee bringing nine originals to the table as well as five well chosen covers. As befits someone who has shared a stage with the likes of The Doors, Billy Gibbons (Z.Z. Top), Sting, John Legend, Train, and more, she’s got a great voice that can handle the wide variety of material with ease. Of the covers, the most interesting are her versions of The Staples Singers ‘I’ll Take You There’ and a very unusual spin through The Great Societys / Jefferson Airplanes ”White Rabbit’, with its prominent saxophone lines. Yes, saxophone. Over on the original material, I really enjoyed the funky ‘Fire’, the bleak and almost despairing ‘Lost You’ and the rockin’ the blooze sound of ‘Cold Hearted Woman’. She shows how versatile she is with he countryfied title track, but if you want purer blues then check out ‘Right Man’. It’s an excellent release, chock full of excellent performances and comes rockin’ the blues approved. I remember SmokeHouse. Their “Cadillac in the Swamp” album was a cracker. More recently I’ve enjoyed the output of Victor Wainwright & The WildRoots. 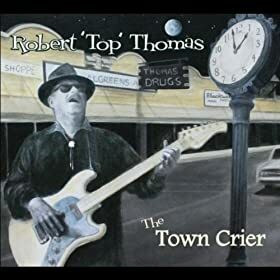 So when Robert ‘Top’ Thomas, one time guitarist and vocalist with SmokeHouse turns up with an album on Victor Wainwrights record label, then I’m going to prick up my ears at the sound of some swamp blues. And my ears were not to be disappointed. In fact Victor Wainwright puts in an appearance here, and the whole record is underpinned by the WildRoots rhythm section, so you’re guaranteed a good noise. Luckily, the songs match up as well, and there are some real crackers here. Thomas has a gruff and well worn voice, something that will alienate others, but as soon as he launches into the delightful ‘Mississippi Quickie’, I’m sold. Elsewhere, the harmonic enhanced ‘Blue Grass’ and the fabulous ‘King Snake Crawl’ are absolute delights and worth the price of admission themselves. Not all the songs are keepers, but there are more winners than losers, so by the time things finish up on a spiritual high with the fantastic ‘It Ain’t Easy’, you can rest easy knowing the journey was worth it. A swift reissue for this album from 2011, and if you missed it the first time round, then don’t be so silly this time around. 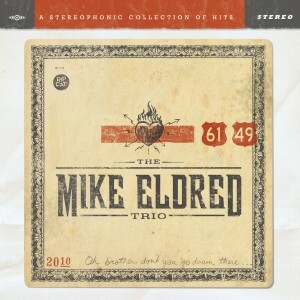 The Mike Eldred Trio deal in a hard rocking mix of blues, roots and rockabilly, all held together by a rhythm section made of former Blasters members John Bazz on bass and Jerry Angel on drums. They’ve even got some top drawer guest performers here including the late Ike Turner, which shows how long ago some of these tracks were laid down. But age does not wither tunes as hot as ‘She’s a Rocket’ and ‘Jake’s Boogie’. You’d never guess what was in store from the opening ‘Don’t Go Down There’, an acapella spiritual number, where Eldred is backed by the Emmanuel Church Gospel Choir. But once you reach the instrumental boogie of the aforementioned ‘Jake’s Boogie’ and the Kid Ramos enhanced ‘Louise’, you know you’re in for a ripstorming ride. ‘She’s A Rocket’ sees Ike Turner pounding out some rock and roll piano, with some great saxophone work. And they can throw in a slow blues as well, as they do on ‘Ruby’s Blues’, and pull it off with ease. There are plenty more big names for you to drool over, as Scotty Moore plays guitar, as does Cesar Rosas, and there is some great Hammond work from Riley Osborn. But nothing takes away from the basic trio, and some great songs. Don’t forget to tune into Mr H every Thursday at 8pm, Her Majestys Great British time, when you will find him Rockin’ The Blues on that there internet radio.